As a dietitian, I work with clients on a broad spectrum of health issues, from weight management to fertility to optimizing performance, but there is one common question asked by virtually every client: How can I improve my energy level? Unfortunately, the idea of “having energy” is often equated to the buzz following a burst of caffeine from a strong cup of coffee or energy drink. It’s easy to lean on quick-fixes to wake up in the morning or get through an afternoon slump. However, true energy is not a state of jitteriness but an alertness and sense of vitality that comes from self care. Occasional periods of fatigue from lack of sleep or a stressful event are hard to avoid but, in general, I encourage clients to practice lifestyle alterations that lead to a calm wakefulness. Exercise, or simply engaging in daily movement, can also help improve energy levels by enhancing blood flow to carry nutrients and oxygen to muscle tissue. It can also help balance blood sugar levels and release mood-improving endorphins. Even 20 minutes of low-intensity exercise, such as walking, has been found to reduce fatigue. The best type of exercise is whatever you enjoy and can practice consistently. For people with sleep issues, I recommend exercising within the first half of the day. Once the basics of sleep, exercise and a balanced eating pattern are in place, one can truly feel the benefits of particular foods and nutrients. Naturally, that brings me back to ginger. 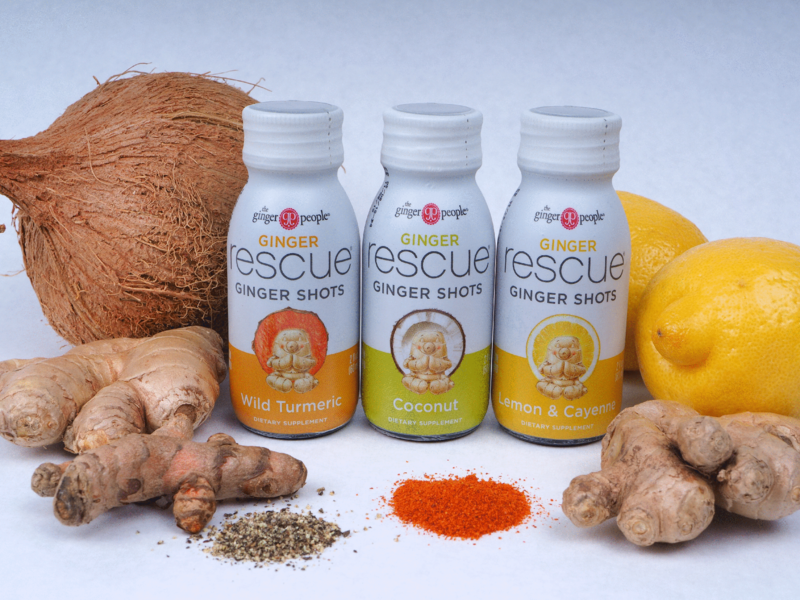 I love incorporating The Ginger People’s new Ginger Rescue Shots as part of an energizing wellness routine. As I do not advise caffeine consumption in the afternoon, these slightly sweet ginger shots are a perfect alternative to sugary indulgences or coffee, which may hinder sleep. The daily ginger shots come in three flavors: Coconut, Lemon & Cayenne and Wild Turmeric. The final flavor contains Curcumin, the active component of turmeric. This active has a wide variety of health benefits, (some of which you can read about here). In some research, it has been shown to improve working memory, attention, alertness and reduce fatigue. Paired with the blood sugar balancing properties of ginger, the shot is a great energy booster. You can shoot them straight or if you want to prolong the enjoyment, add one shot to a big glass of cold sparkling water. Footnote: Please speak with your healthcare provider before making any major lifestyle adjustments.